Dr. Stephen G. Boyce is a board certified bariatric surgeon who specializes in the duodenal switch and revision surgery. His practice, The New Life Center for Bariatric Surgery in Knoxville, TN was accredited as the 7th Center of Excellence in the Nation. Dr. Boyce has performed over 4,000 weight loss surgery procedures and has over twenty years of experience in the field of bariatrics. Dr. Boyce is an educator for Ethicon Endo Surgery and regularly proctors other surgeons on surgical techniques, such as the DS procedure. Additionally, he has a special interest in vitamin and mineral supplementation for the bariatric patient, which prompted him to create his own bariatric vitamin company, Bari Life Bariatric Supplements. The line of vitamins that Dr. Boyce created includes the the first ALL-IN-ONE custom bariatric multivitamin formula. The formulas are based on the American Society of Metabolic and Bariatric Surgery (ASMBS) recommendations. It’s the only product of its kind. DS patients need to protect and encourage good bone health by taking in 3000-6000 IU’s of vitamin D daily along with 1800-2400 mg of calcium daily. There are multitudes of misinformation about vitamin supplementation for the DS patient after weight loss surgery. You must be careful what you read on the internet. I’ve seen wrong information posted in various support groups, obesity websites and even medical websites. The truth is, there are no published studies of how the body absorbs various nutrients after bariatric surgery. Medical professionals agree that once a patient undergoes bariatric surgery, the body adapts and learns to attain the vitamins and minerals it needs. The clinical data that I’ve collected for many years, as well as my clinical experience have given me the advantage of knowing what vitamin regimens will and will not work for post bariatric surgery patients. Patients who choose to have the DS procedure are at higher risk for vitamin deficiencies after bariatric surgery and it’s imperative that they take the appropriate vitamins. 75% of all bariatric surgery patients are deficient in SOMETHING prior to surgery and usually it includes iron and Vitamin D. Patients are way ahead of the game if they begin to take bariatric vitamins BEFORE surgery. Not just any vitamins, but those that meet or exceed the ASMBS guidelines. It is important after the DS surgery to have labs drawn regularly along with regular thyroid function tests. It’s not surprising for a DS patient to develop thyroid trouble. Sometimes it takes a while for the body to adjust and Vitamin D shots are necessary, as well as Vitamin A and sometimes additional iron will be required. Some patients just have more trouble absorbing D and A. Once the levels are brought back up to normal, the recommended dosage of multivitamins for the DS patient of the Bari Life Multivitamins is all that’s needed. It is true that many DS patients end up with significant deficiencies in the fat-soluble vitamins, ADEK, however, many people who take Bari Life Multivitamins do not have deficiencies. Bari Life multivitamins have extremely high levels of everything I just mentioned. The multivitamin formulas come in two different forms—powder and non-chewable tablet. The multivitamin powder comes in an Orange and Cherry Berry flavor. Coming soon is a flavorless powder that will be great to mix with chocolate protein drinks. The non-chewable tablet is vanilla scented and has a coating for easy swallow. I recommend the powder to my patients directly after surgery for the first 4-6 weeks because the powder allows for the easiest absorption while healing. After 4-6 weeks I give my patients the option to switch to the tablet. I also prescribe probiotics for all of my bariatric patients. I believe that everyone (non-surgical and surgical patients) benefits from taking probiotics… I take them myself and I have not had weight loss surgery. I have created a multi probiotic that contains 15 billion CFU’s in one capsule. I recommend just one of these capsules a day. Studies indicate that bariatric patients need at least 10 billion CFU’s daily. DS patients need to take 8 multivitamin tablets daily OR 3 scoops of powder daily. I recommend taking the tablets throughout the day in increments of 2 or 3 tablets. For example, you should take 2 in the morning, 2 at lunch, 2 in the evening and 2 before bed. It’s also fine to take them in increments of 3 tablets. For example, 3 in the morning, 2 at lunch and 3 in the evening. It’s perfectly acceptable to spread them out even more. It would not be good to take them all at once because the human body would not be able to absorb the large amount all at once. For the multivitamin powder I recommend taking one scoop of powder in the morning, one at lunch and one in the evening. I advise all of my bariatric patients to use the multivitamin powder for the first 4-6 weeks following bariatric surgery because the powder is absorbed the easiest. You can mix the powder with any fluid. Water is a great option to keep you hydrated, but I also recommend adding it to a Bari Life protein drink. This way you’ll get your protein too. You can also mix it in to yogurt and even take it all by itself like a pixie stick. Some of my patients like to take it in just one cup of water, but others like to add it to a large bottle and drink it gradually. The main reason I started Bari Life® was to give my patients access to an easy, affordable and well tolerated vitamin regimen after bariatric surgery. I find that many of my patients are not compliant with other leading bariatric vitamin brands because they are complicated and expensive. 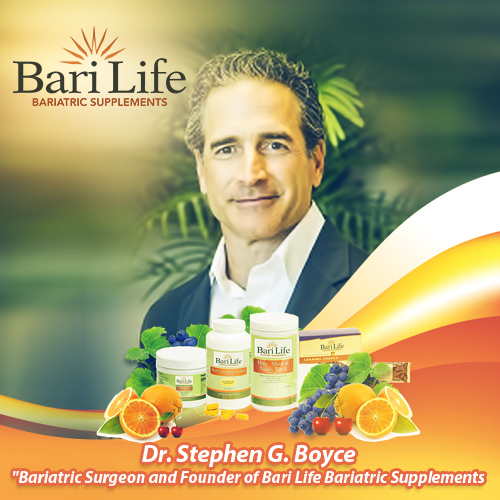 I never intended to sell my products beyond my own bariatric practice, but I’m pleased to say that because my patients have seen great results using the Bari Life® formula, it has given me the opportunity to offer the Bari Life vitamin line to bariatric surgery patients worldwide. Bari Life is high quality bariatric vitamins that are clinically proven supplements to help in post bariatric surgery. Yes, what a wonderful phsohioply making life work. That is what it is all about. I agree losing weight is hard work even with WLS good for you for educating us about that!Your stir fry sounds good I would eat that! Yes, what a wonderful phlhosopiy making life work. That is what it is all about. I agree losing weight is hard work even with WLS good for you for educating us about that!Your stir fry sounds good I would eat that!